Leading off today: Seven boys and five girls are on the preliminary list of candidates for the state's top awards for senior basketball players. The Basketball Coaches Association of New York released its candidates for Mr. New York State Basketball and Miss New York Basketball this week. • Brooklyn Collegiate guard Glen Anderson. 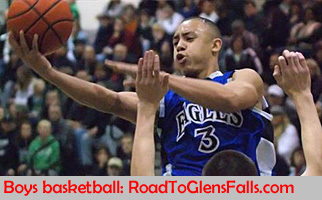 • Our Savior Lutheran guard Dashawn Davis, Sr.
• Glens Falls guard Joe Girard. • Park School guard Noah Hutchins. • Lawrence Woodmere Academy center Aidan Igiehon. • Albany Academy guard August Mahoney. • Cardinal Hayes guard Joe Toussaint. • Ossining guard Aubrey Griffin. • Ward Melville guard Lauren Hansen. • Christ the King wing Cavina Rickards. • Christ the King guard Kaelynn Satterfield. • Long Island Lutheran guard Celeste Taylor. Sec. 2 star in 2K club: Lake George senior Graceann Bennett scored her 2,000th career point early in the first quarter of the Warriors' 49-14 girls basketball win over Granville on Wednesday. The 6-foot-2 Georgetown commit finished with 19 points, 16 rebounds, six blocked shots and four assists, as Lake George won its 12th consecutive game. She enters the weekend with 2,015 career points. Bennett is at least the third New York girl to reach 2,000 points this season, joining Allison Moreau (Sauquoit Valley) and Dani Haskell (Franklinville in Section 6). Football commitment: Hornell defensive lineman Rayyan Buell has verbally committed to continue his football career at Rutgers. Buell, a third-team all-state selection in Class B, is taking his official visit to the Big Ten school this weekend after canceling a planned visit to Rice. Oh, Canada: Monroe-Woodbury junior pitcher Samantha Ryan will play for Canada in the World Baseball Softball Confederation XIII Under-19 Softball World Cup in Irvine, Calif., in August. She was picked by Keith Mackintosh, head coach of the 2019 Canadian Junior Women's National Softball Team. Ryan's mother is from Edmonton, and the teen recently was granted dual citizenship in part to give her a chance to represent that country. An opportunity to play for the Canadian junior team is another step toward Ryan reaching her ultimate goal of becoming an Olympian. The sport will return to the Olympics beginning with the 2020 Tokyo Games. Shrinking numbers: The Post-Star tackled a topic that just about every reporter covering a high school sport could also put on the to-do list. According to the paper, an unprecedented three Adirondack League girls basketball programs do not have junior varsities this winter. With a shrinking pool of players, Argyle, Fort Ann and Hadley-Luzerne are fielding varsity and modified teams. Hadley-Luzerne has two modified teams. Shrinking enrollments, low participation and sport specialization are among the primary factors. "In Argyle, of all places, where we're a basketball school,â€� coach Terry Chamberlain said. "I never would've guessed it, never projected it. But the show goes on." 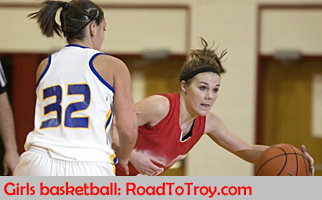 Chamberlain is working with just 12 varsity and 11 modified players in the program. There simply was no way to redistribute them into three squads. Fort Ann has similar numbers. "We want to put kids in a position to succeed, not fail, and we acted in the best interest of our program top to bottom," AD Jason Humiston said. "Confidence is a big part -- if they get beat down, they're not going to come back." This should be good: MileSplit and FloTrack, two dynamos in the world of track and field, have forged a partnership to produce more than 70 live web streams of big events in cross country, indoor track and outdoor track in conjunction with the NFHS Network. Included in the schedule is the NYSPHSAA indoor meet at Ocean Breeze on Staten Island on March 2, which rates as great news for followers of the sport across the state and the country. The NYSPHSAA signed a 10-year agreement with the NFHS Network last year. Maine goes small: A two-division format for eight-man football involving 10 schools could debut next fall, the Maine Principals' Association football committee decided Thursday. The plan next heads to the MPA Classification Committee for its consideration Feb. 11. The plan is subject to final approval by the full MPA membership this spring.